The Russian Defense Ministry has shed light on the visit of Minister Sergei Shoigu to Syria amid the operation to fully free the city of Deir ez-Zor. MOSCOW (Sputnik) — Russian Defense Minister Sergei Shoigu discussed the Syrian conflict and issues of bilateral military cooperation with Syrian President Bashar Assad, the Russian Defense Ministry said, commenting on the minister's visit to Damascus. "During the meeting, the issues of military and military-technical cooperation were discussed in the context of the successful actions of the Syrian government troops with the support of the Russian Aerospace Forces aimed at the complete destruction of the Islamic State terrorist group [Daesh, ISIS, banned in Russia]," the ministry said in a statement. The sides also discussed the stabilization of the situation in Syria, the safe zones as well as the humanitarian assistance to the Syrians. Shoigu's visit on orders of Russian President Vladimir Putin comes amid the operation to fully liberate the city of Deir ez-Zor and surrounding area from Daesh terrorists conducted by the Syrian army with the assistance of Russian warplanes. Last week marked the lifting of the three-year Daesh siege of the city of Deir ez-Zor and the liberation of a local airfield, which had kept more than 1,000 Syrian troops locked in since January. However, the fighting to fully liberate the area is still underway. The successful Deir ez-Zor operation was the biggest breakthrough against Daesh since the terrorist group first launched an offensive in the province. The terrorists had been blockading Deir ez-Zor since 2014, with food and other supplies only being airlifted into the city. 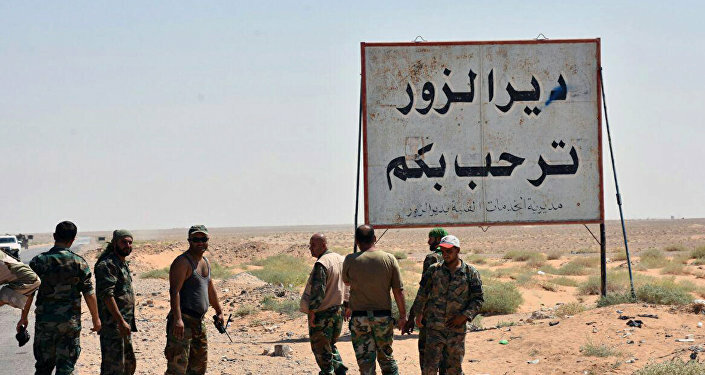 The group also took control over a large swath of the province of Deir ez-Zor and cut off roads to government-held districts.